Your success in eliminating moles from the skin will be determined by the strategy that you apply. You need to select a removal technique that will effectively clear the moles without imposing severe side effects that may compromise the integrity of your skin. You’ve probably tried various methods that never worked on you. Right? Well, if your recent mole removal trials have been laced with failure and discouragement, you need to ensure that the products that you use are compatible with your skin type to avoid such discouragements. In this article, you’ll get well-illustrated methods that you can use to eliminate the moles fast! While most moles are safe, they can be unsightly. The situation is worsened by an intensification of the moles on the face during your adulthood phase. The appearance when you’re past 30 years is not only frustrating but can also be a health risk that needs immediate interventions. Majority of malignant moles develops when an individual is past their adolescent stage. You can choose to live with normal moles since they rarely interfere with your normal life. However, if you feel the urge to eliminate them, then you will have numerous elimination methods to choose from as detailed in this article. Whatever the method you choose, you should ensure that you never compromise on your safety! It is advisable that you look out for a dysplastic nevus which would require professional examination before clearing it. Dysplastic nevus differs from your normal mole since they are larger, have irregular boundaries, and varies in color. Such a mole is usually flat with slightly scaly surface and has a significantly higher chance of progressing into a melanoma. 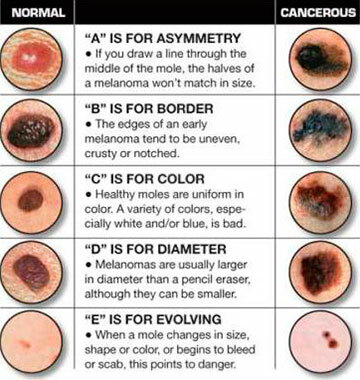 Not all moles that develop during adulthood are cancerous! However, if the number of the moles keep growing, your chances of developing skin cancer increases. Individuals who have more than 50 common moles are at a heightened risk of developing melanoma. As such, you should always seek experts’ opinion if the moles keep growing on your skin. Also, when you realize that any of your moles have some fresh blood on them, you should not hesitate to consult a dermatologist. Surgical Removal. This method will require the intervention of a professional to guarantee safety and efficiency. You should particularly avoid self-medication if you observe dysplastic moles on your skin. The choice that the professional will make largely depends on the status of the mole. Shave excision is ideal for raised moles where the doctor applies local anesthesia to the area surrounding the mole. A sharp scalpel is then used to shave the mole off. The punch biopsy is used if your moles are small. However, if the doctor realizes that your mole is malignant, they will use excisional surgery where the surgeon cut the mole entirely and then stitches the wound. To find out more details on surgery, go here. Cryosurgery or Freezing. This method will remove your mole by freezing and destroying their tissue using liquid nitrogen. The doctor will either spray the nitrogen directly on the affected area or apply it using a cotton swab. 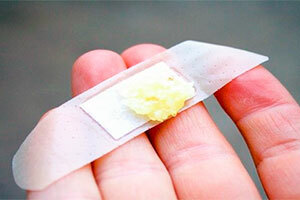 This method requires multiple application and may result in a blister on your skin. The scar will, however, disappear as the section heals. Read more here. Electrocoagulation. This entails burning of your mole using electric current. The shock that the tissues experience from the current kills them thus eliminating your moles. You will require to attend several sessions before the moles are entirely eradicated but there will be no stitching required. There’s more information in this article about mole cauterization. Home remedies. If you’re sure that your mole is not malignant, you can skip the professional removal and use natural mole removal techniques instead. The removal at home will involve the use of readily available materials such as Aloe Vera, garlic, iodine, apple cider vinegar, baking soda, castor oil, and honey. When using these substances, you should ensure that you apply directly on the site to avoid irritation and other side effects on your healthy part of the skin. This is particularly important if you are using acidic juices such as apple cider vinegar. Also, if your skin is sensitive, you should only let the substances sit on your skin for a maximum of 15 minutes to avoid corrosion and other severe reactions. Further details can be found here. Other methods that you may consider include the use of radiosurgery and laser treatments. The two techniques work by burning the mole tissue using radio frequency waves and laser beams respectively. Moles appearing on the face are unsightly and requires immediate intervention for their complete removal. The face is highly sensitive and you must be careful when applying any mole removal technique on the face. Determine the Necessity for Removal. As earlier indicated, moles are largely harmless and you may opt to live with them. However, you should keep examining them to determine whether there is an emerging issue that may necessitate their removal. We recommend that you regularly count their numbers, check their structure as well as check their color. If you notice a rapid increase in the number of moles and inexplicable changes of the existing moles, then you may consider their removal. In such cases, the first step would be to consult a professional who will determine the safety of the removal process. Also, they will recommend the best method to use for your consideration. Choose the Method to Use. After you have decided that it is necessary to remove the moles from your face, you need to determine the method that you’ll use. Nature of the moles. If your moles are raised, you may determine to use shaving surgery technique. But if they are flat, then you’ll have no option but to use excision method. Location of the mole. The face has sensitive organs including the eyes and the nose. Never use methods that can destroy adjacent tissues especially when the moles are just next to the delicate organs. Here, you may choose to use home remedies if the moles are not malignant. Medical conditions of the mole. Normal moles give you the liberty to use whichever method you choose. If the doctor sees abnormalities on the mole, you’ll be forced to adopt excision technique! Apply the Method You Choose. This entails the practical removal of the moles. The application should be guided by the safety regulations of the specific technique. For example, you should avoid using acidic removal methods when there is the risk of acidic content spilling over to the sense organs. If you’re using DIY techniques at home, ensure that you maintain basic hygienic conditions to achieve your desired results. Facilitate the Healing Process. Once you’re through with the removal stage, you will need to allow an ideal method for healing. This is crucial when you are dealing with a method that will leave wounds and scar behinds. Also, ensure that you clean your face regularly to enhance the healing process. 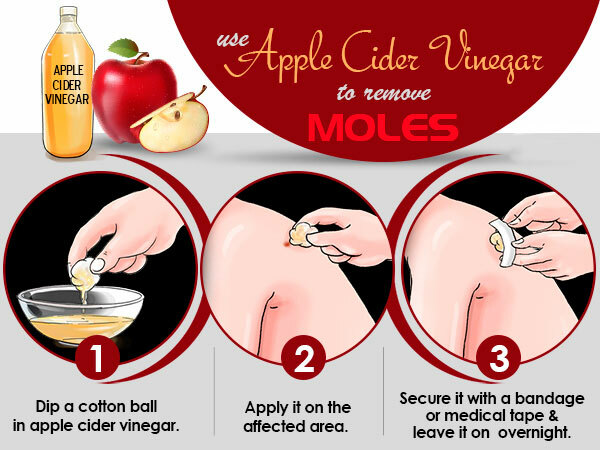 There are numerous home remedies that will answer the how to remove moles safely question that has lingered on your mind for long. These methods involve the use of substances that you can readily obtain from the shelves of your kitchen thus making it convenient. Apple Cider Vinegar. Its acid content help to corrode the mole and it will fall off after some time. You’ll just need to apply the contents directly on the moles using cotton balls. Let it sit overnight after which you should wash it off with plenty of water. Ensure consistency to achieve the best results. This home remedy contains enzymes that destroy the moles and also lighten the skin surrounding the area. Just crush the garlic and apply it on the affected region. Let it sit for approximately four hours. We recommend that you do this daily for five days. Before reapplying the garlic, disinfect the area using alcohol. Also, ensure that you regularly apply petroleum jelly to protect the skin. Iodine. This liquid initiates the natural death of the mole’s tissue. Ensure that you clean the affected area before applying the 5% iodine solution. Cover it using a clean bandage and leave it overnight. You should repeat the procedure daily for two weeks. Iodine stains; apply lotion to prevent skin staining! 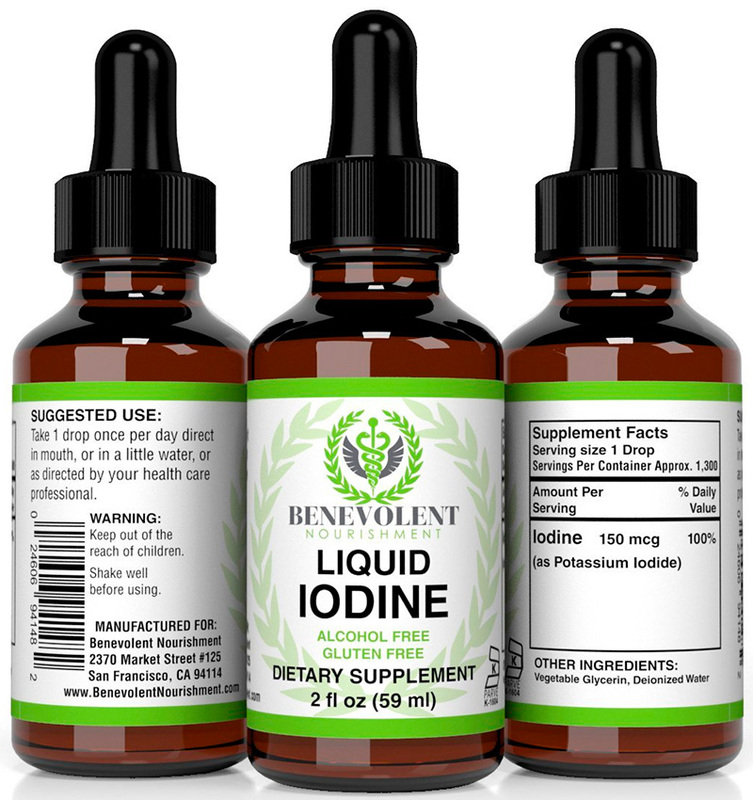 While staining of the skin may occur, iodine heals the moles without scarring. 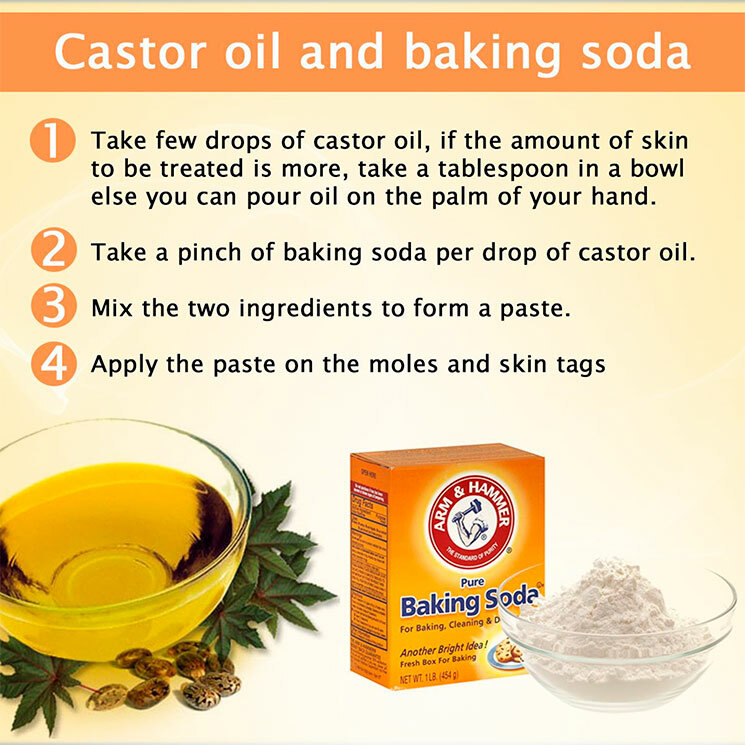 Baking Soda and Castor Oil. Apply this mixture directly onto the affected area to achieve the best results. You should use it daily for approximately one week. The most effective technique of eliminating the moles depend on the type of skin, nature of the moles, and the location. However, our pick for the best mole removal technique is the use of home techniques such as iodine. Iodine is highly efficient in destroying the mole’s tissue which makes it one of the fastest method of mole elimination. What’s best about it is the fact that it leaves no scar! We also insist that if the method fails to work, it is crucial that you seek professional guidance. Clearing of moles may appear like a simple process but you need to be relatively cautious to prevent severe side effects on your skin. Ensure that you extensively consult before settling for a specific technique to use. Here, we’ve recommended some techniques that we encourage you to study and establish the best one for your skin. Always talk to a doctor if you are in doubt about your condition.